The Aberdeen boss feels Pat Fenlon's men could remain undefeated until the end of the season if they can replicate their performance against his side. Craig Brown believes Hibernian are capable of dragging themselves away from the SPL danger zone by going on a long unbeaten run. Brown’s Aberdeen side were held to a 0-0 draw at Easter Road, their second at the ground this season. The Dons beat Pat Fenlon’s men 1-0 on December 17 to spark a run of four wins and four draws from nine matches. 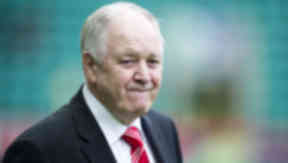 And the former Scotland boss believes the Leith side have the quality to match that run of form. He said: "I think Hibs could go on a run. What I saw there is sufficient evidence. "Hibs are capable of going unbeaten until the end of the season if they dig in like that and you know (striker Garry) O'Connor will score a goal." Injury-hit Aberdeen face Queen of the South in a cup replay on Tuesday night. And Brown was happy with how his squad performed in a game of few chances against the capital club. He added: "There would have been a lap of honour if someone had scored a goal. "When (Mitchel) Megginson hit one across the face of the goal, I could've run from the dugout and headed it in, as I said to (Scott) Vernon."